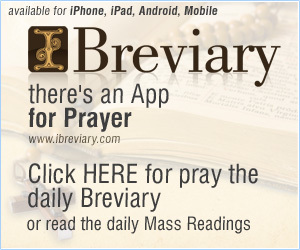 As noted in our About page, Francisco Garcia Diego y Moreno, a Franciscan priest, was the Bishop of the Diocese of the Two Californias (1840-1846) during a time when many of the missions and church lands had been transferred to secular authorities. He died shortly before the Mexican-American War (1846-1848), which transferred all of California from Mexico to the United States. From 1842, Garcia Diego lived in Santa Barbara and regularly offered Mass at Mission Santa Barbara, where he is now buried. 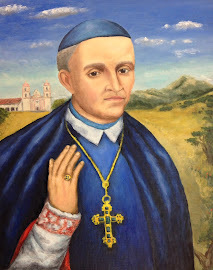 We interviewed Michael Aberle about his depiction of this bishop painted specifically for our Sodality of Garcia Diego and so prominently featured on this website. Michael’s painting is based on a surviving photograph and painting. Michael’s portrait is painted with acrylics in a style inspired by el Greco. Garcia Diego stands in the sunshine looking out with the Mission plaza behind him. His hand is raised in benediction. He wears his pectoral cross and episcopal ring. Michael painted the face last. The Bishop appears to have a stern expression. We have often wondered what the Bishop was really like, and whether he would approve of our current efforts. Perhaps beneath this holy sternness lay a pastor of gentleness. The Bishop wears a blue cape and cassock, rather than the grey or brown typically associated with Franciscans. Michael states that blue was a significant color for devotees to the Immaculate Conception, even before the official definition of that dogma in 1854. Perhaps Garcia Diego was one of these; certainly he was devoted to Mary, and he chose Our Lady Refuge of Sinners as patroness of California (see our previous post on that subject). On an off-topic note, today is the feast of Saint Teresa of Avila. We are already planning a post about her next October. Happy feast.